Your footwear Freshmen will love the collegiate Newbie from SOREL® Kids! Water resistant suede leather and felt. Quilted shaft. Pull-on construction. Elastic band around shaft provides secure fit. Fleece lining keeps feet warm. Removable EVA footbed features a fleece topcover to keep feet in optimal comfort. Lightweight EVA midsole. Outsole grade EVA with rubber traction pods. Imported. Measurements: Heel Height: 1 in Weight: 13 oz Circumference: 12 1⁄4 in Shaft: 8 in Platform Height: 3⁄4 in Product measurements were taken using size 7 Big Kid, width M. Please note that measurements may vary by size. 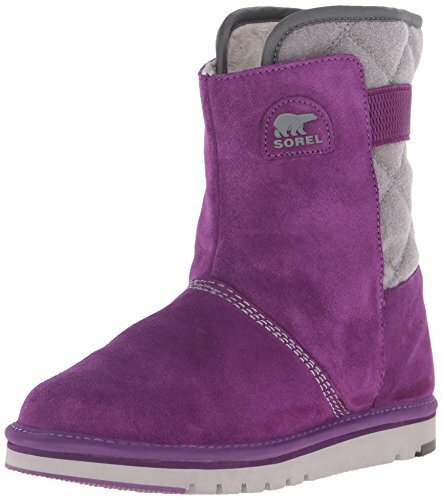 Your footwear Freshmen will love the collegiate Newbie from SOREL® Kids! Water resistant suede leather and felt.